blaine and bethany travels: Welcome! Welcome to Blaine and Bethany’s travel blog! We have begun a 6 month journey traveling around parts of Asia and beyond. To see more on details on our trip visit LINK. 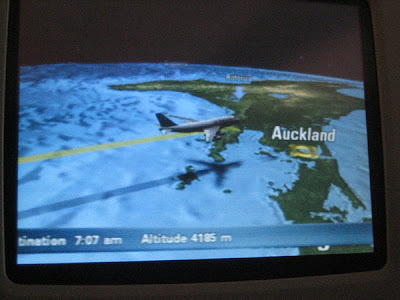 First things first, LA to Auckland is a very long flight. But, I did catch up on my movie watching; Oceans 13, The Simpsons, The Contract, some touring New Zealand show and Hairspray. Each person had their own little TV to watch. I could check how far we had to go by clicking on a little plane icon and this 3-D plan screen would come up. One more 3 hour flight to get to Sydney!